In honor of this week's publication of my book, A History of Cannon Mountain: Trails, Tales and Skiing Legends… I’m posting an essay I wrote several years ago, before Mittersill was officially reopened as part of Cannon Mountain. The swath of gray clouds pours over and around Cannon Mountain, exposing glimpses of winter sunshine, bursts of warmth onto the snowy ribbons of ski trails, as we look back at the summit from the top of the saddle between Cannon and Mount Jackson, catching our breath after a short climb. Fifteen minutes earlier we’d been in the fog at the top of Cannon, contemplating the hike over the saddle. Now, standing in an island of light, a donut hole of blue sky above us, it seems we made a good choice. Unlike many ski areas in North America, Cannon has not been bastardized by a glut of humongous second homes and row upon row of condos built at its base and encroaching its slopes. The view from here includes more houses than it did when I was a child, but that is true of many places, and here they still only dot the landscape, without ruin. The climb seemed longer then, the skis heavier for my small body to carry. But standing on the saddle, that bridge between familiarity and adventure, groomed and ungroomed, has always inspired in me anticipation of the sweet turns to come. Behind us lies the boot-packed trail we just climbed, leading gradually up from Cannon, whose ski trails reach like icy appendages toward the valley. Most of the trails from the summit are nearly as old as skiing in America. 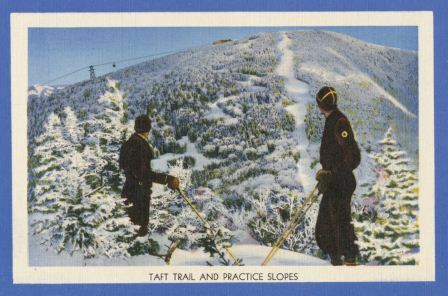 The one we just descended, Taft Slalom, is part of the oldest mountain trail cut specifically for skiing in this part of the world, back in 1932 and ’33. The others were added beginning in 1938, when Cannon Mountain became home to the continent’s first passenger aerial tramway – and Cannon became one of America’s first ski areas. On the saddle’s other side, through spruce trees stunted to midget form by decades of ice storms and wicked wind, lies the promise of an adventure down trails forgotten by many, but still revered by Cannon old timers and more recent locals. There are runs nearly overgrown in places, where legends were once made of daredevilish racers who were willing to launch their bodies down steep, icy, narrow passages through forests logged then regrown. And there are newer, hidden runs, cut clandestinely by more modern thrill seekers. On days when there is new snow, a thin, steady line of hikers winds up the saddle, and visitors to Cannon wonder where the line leads. Little do they know the joy on the other side, the exhilaration of the turns earned with a short hike, a few beads of sweat. But on this day of weird weather and no new snow, we are the only two here. On the saddle, skiers pause to ponder the view and their imminent run. A tangle of runs – some well-traveled, many tucked secretly into the forest – winds down from the saddle. Skiers might head down the Tucker Brook Trail, built by Civilian Conservation Corps workers in 1934. The trail’s entrance is hidden now in the brush, and its series of 13 quick, steep turns has been legendary among area skiers for generations. Or they may choose the less intimidating Baron’s Run, named after the charismatic Austrian Baron who established the now defunct Mittersill ski area on the opposite side of the saddle from Cannon. The Baron’s village of chalets remains nestled into the nooks of the mountain, below the old ski trails and rusting chair lift towers. Today we head through the first narrow trail with no specific route in mind. A few turns down the concave path of uneven moguls is all it takes to get breathing hard again, and we stop to catch our breath and look through the woods, wondering if we should bushwhack in search of a clearing we’ve seen hidden somewhere along that ledge. We decide to keep on the way we were headed and soon funnel out at the top of the expired chairlift, where a labyrinth of overgrown runs waits for us. We point our skis down the old lift line, dodging poplar shoots and small fir trees. At junctions we change direction with little conversation, creeping lower and lower, as the trees grow taller and the rooftops of the Baron’s village come into sight. The snow is not deep, but it is smooth, and we glide turn to turn, finding a rhythm, then losing it, and finding it again. Eventually we turn sharply to the right, on a narrow path through a forest of white birch that leads to Cannon’s base area. The trail rolls from slight mound to small divot, and we push with our poles, projecting our bodies between the trees. Soon we can hear the steady electric hum of a chairlift bullwheel and the voices of skiers calling to each other. We pop out onto one of the lower trails, a wide, flat beginner run so opposite of the pitch we just skied. We glide to the lift line, smile, and join the sparse crowd of skiers who remain oblivious to the secrets of the saddle’s other side. Sunday, as I was walking to the garden to plant the seeds which I hope will bear an abundance of vegetables in the weeks and months to come, I was ambushed by a slew of miniature helicopters. The tiny whirligigs came spinning on a gust of wind from a great sugar maple, which only a couple of months ago was surrounded by a sea of snow, with two sap buckets hanging from its wide trunk. 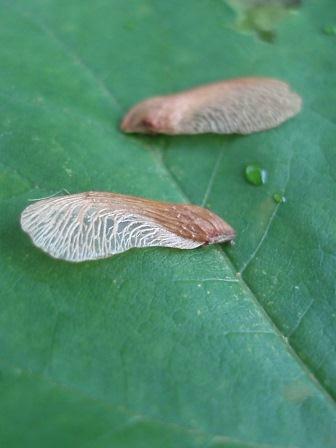 On Sunday, the small disks – the tree’s winged seeds – cut merrily through a summerlike mid-day. I’d never seen such a fleet. My brothers and I used to take great delight in collecting the seeds – called samara – that fell from the large maple tree, whose thick limbs were perfect for climbing, next to our back deck. We’d toss handfuls of helicopters into the air, or drop them over the railing one at a time, wonderingly watching their twirling descent to the ground. The bombardment of seeds the other day reminded me of those childhood helicopter launches. Sometimes I feel as if adulthood – dare I admit middle age? – has snuck up on me. Wasn’t I just a kid last week, flitting through the fabulous, carefree days of summer with skinned knees and new freckles? How is it that I have three kids of my own, that my parents are grandparents, that those lazy summer days are now filled with so much busy activity? Likewise, the full bloom of late spring somehow surprises me each year. The snow seems to take forever to recede after ski season, the green emerges painstakingly slowly – a wisp of grass here, a budding tree there, the miniscule leaf of a lupine poking out from the brown field. And then, all of a sudden, my children are handing me great golden bouquets of dandelions, the lilacs are in full bloom, and the forests bordering the fields have formed a broad canopy of foliage. And so it was this year, one day hauling buckets of sap from the old sugar maple for our small sugaring operation, the next marveling at the tree’s fruit spinning through the bright air, seeking a place for the next generation to take root and thrive.